So I haven’t told you about my newfound love of Heywood Wakefield furniture and need to catch you up on the latest surge of using vintage in the home. You see, Chaddy Daddy and I have been contemplating a bedroom makeover for a while since currently the Boudoir consists of a hodge-podge of mismatched, hand-me-down furniture, a “doorless” closet, and multi-colored walls due to an excess of paint samples and a case of extreme indecisiveness. Well, during one of my early morning caffeine-induced internet browsing sessions, I stumbled upon a blog post where the writer describes how she found the perfect new bed to go with her existing vintage Heywood Wakefield furniture. I was intrigued because, you see, the bad thing about midcentury modern, vintage, or antique beds is that its nearly impossible to find one any bigger than a full size as queen and king sized beds weren’t really manufactured until later. When I saw the picture of the bed, I fell in love with its smooth curves, honey hue, and the fact that there are loads of original vintage pieces to match. Isn’t she lovely??? I knew immediately that it was time to redo the love nest and this bed was destined to be the center piece! 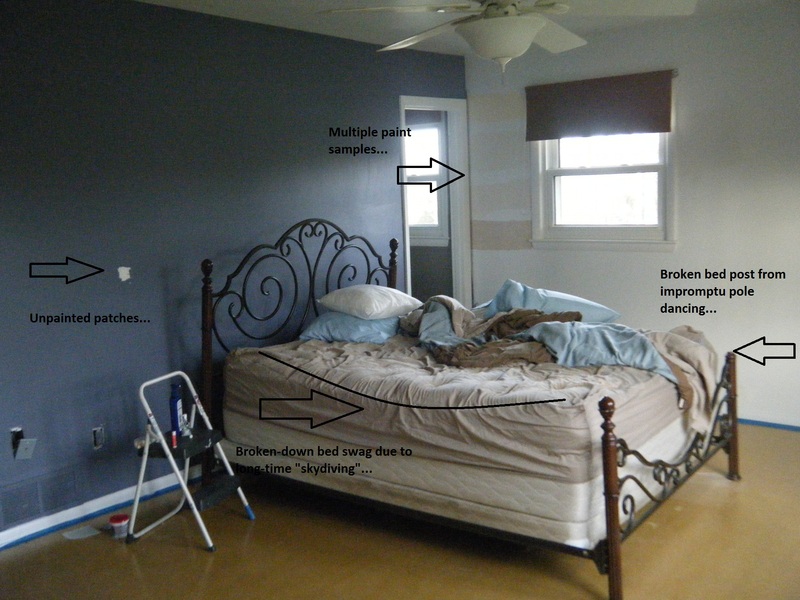 I’m almost ashamed to post it, but below is a picture of our current bed and bedroom…. It’s seen better days by far, and if you’re wondering why it closely resembles a sway back mule, please know it’s due to Chaddy Daddy’s excessive “skydiving” a.k.a. 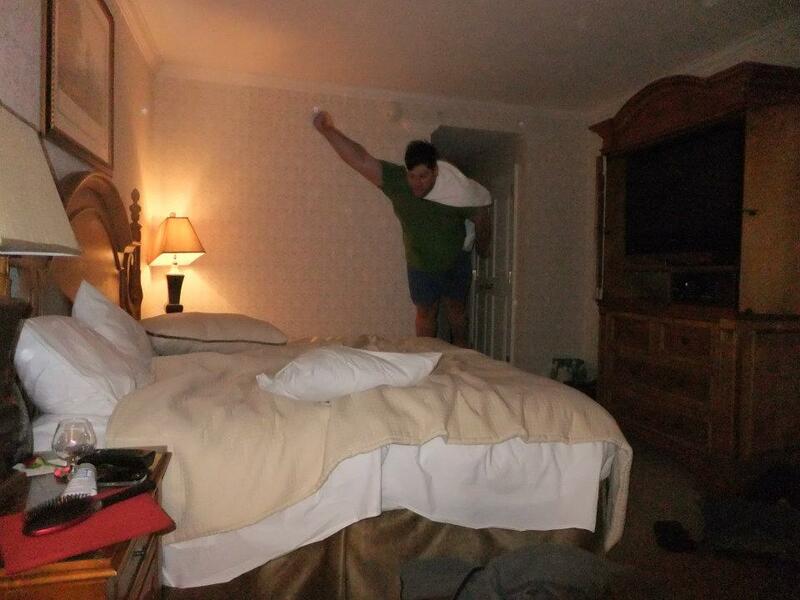 “bed jumping”, a phenomenon where he leaps high into the air before face planting into the bed all while demanding I photograph it repeatedly in order to catch that elusive perfect point of levitation. 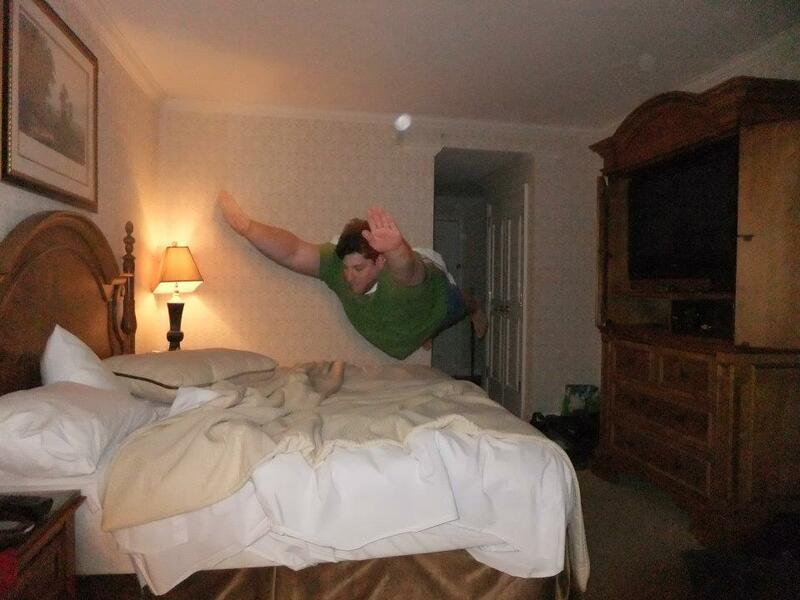 Google it…there’s entire websites with nothing but “bed jumping” pictures considered “art” by some (insert eye roll and a heavy sigh here). Anyway, I’ve digressed. 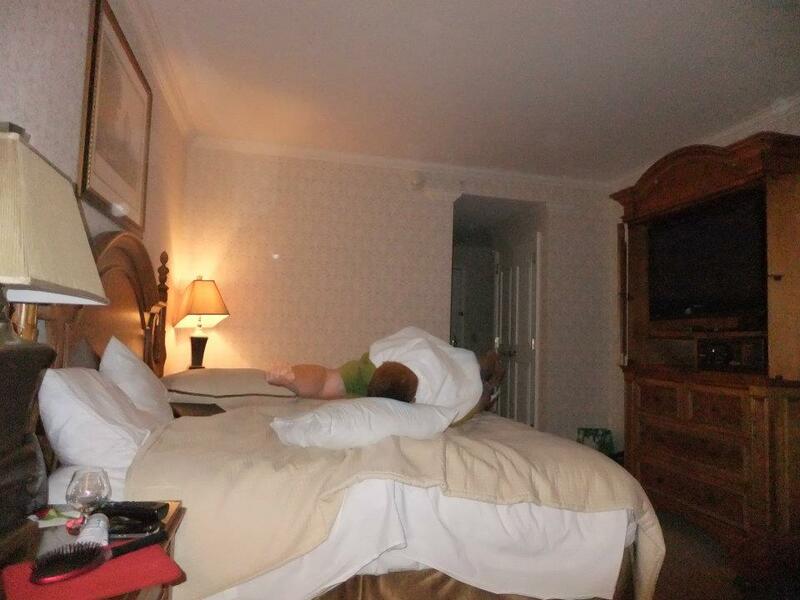 So I ordered the Heywood-Wakefield bed in Queen Size, much to my Mother’s Horror. She insisted I upgrade to a King Size, but Chaddy Daddy and I are accustomed to a Queen Size and there’s no use in paying for more bed when I only give him a sliver of mattress anyway :). The bed won’t be here until the end of March, so I’ve had time to search for vintage pieces to match. 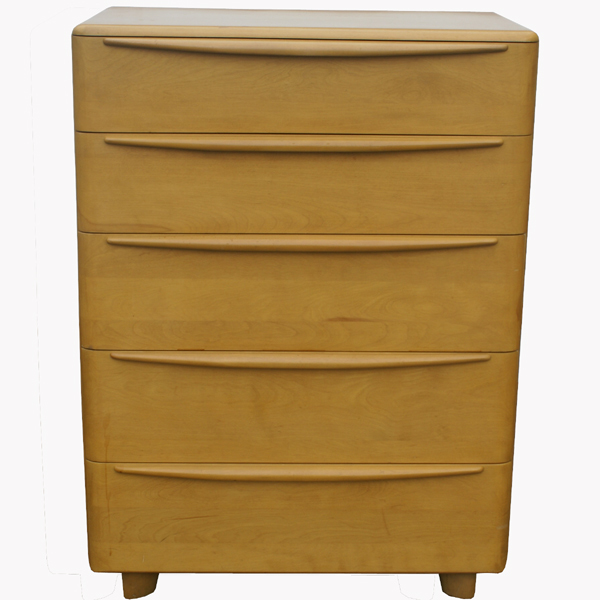 Heywood Wakefield made furniture from 1897 to 1979 with its most popular pieces made between 1940 – 1960 and was known for its beautiful art deco lines and blonde opaque finishes in Wheat and Champagne. 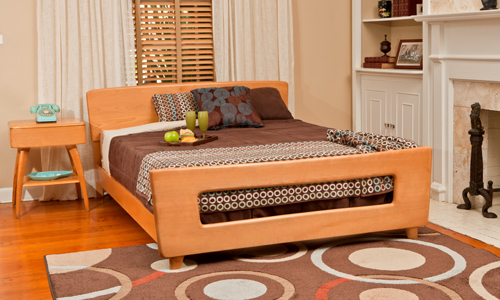 I am personally fond of the Encore line in the wheat finish and chose this line for the bedroom. So, I am gathering pieces here and there for the bedroom remodel and can’t wait to post more about it, but you, like me, will have to be patient….